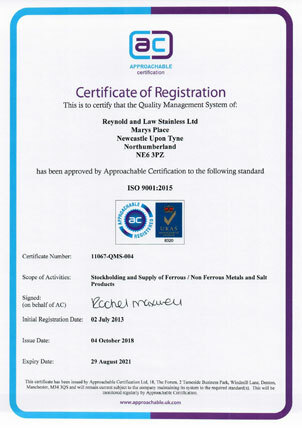 Quality Assurance - Reynolds & Law Ltd.
Reynolds and Law Stainless Ltd is one of the country's leading independent stockists. We operate a bespoke stock management system which links our various units and divisons. The Company is accredited to BS EN ISO9001 as a supplier of assessed capability. As such we have accepted a commitment to provide materials of the highest quality and to consistently meet or exceed Customer’s expectations of service levels. Our Quality Management System plays an essential role. It both defines the Quality Expectations and provides the tools for quantitative analysis of our performance against these goals. Management reviews are held on a regular basis and ideas for improvement are seized upon. Our Managers are knowledgeable and well qualified individuals with a fund of experience in our industry. Our Quality Management Team have a wealth of background experience and we have well trained and long serving staff at all levels.